It’s not easy being an older brother or sister. A lot of responsibilities are on your shoulder. Not only do you have to help around the house, but you also have to help your parents look out for your younger siblings. We thought that only applies to humans. Believe it or not, it applies to dogs too! This old white Lab feels it’s his responsibility to look out for his younger and smaller siblings. So when they’re all going for a walk with his humans, he thinks it’s his job to walk his little Dachshund brother. This old Lab looks so sweet when he’s holding the Dachshund’s lead in his mouth. 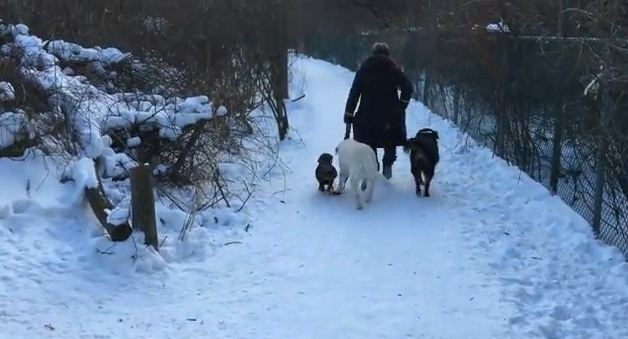 They all look so adorable taking a walk together! You gotta see this! Awww…dogs are just the sweetest, aren’t they? Have you ever had a dog who helps you watch over your other dogs? Or maybe a dog who helps you around the house? Leave a comment and share your story with us!